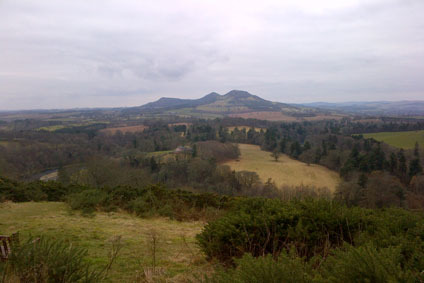 This weekend we were out and about in the beautiful Scottish Borders area, visiting the Border Abbeys. There are four magnificent (now ruined) abbeys within a short distance of each other, located at Melrose, Dryburgh, Kelso and Jedburgh. These medieval monasteries were built during the reign of King David I, and, due to their proximity to the border with England, all suffered during the turbulent centuries of war between the Scots and the English. All four abbeys were burned to the ground by English troops, only for them to be rebuilt and burned again. The abbeys eventually fell out of use in the years leading up to the Protestant Reformation of 1560, which saw the decline of Catholicism in Scotland and the rise of the Protestant Church. The first Cistercian abbey in Scotland, Melrose was founded by King David I in 1136. It rapidly became an important site, and as such it was attacked several times, notably by Edward II in 1322 when many monks and townspeople were killed and much of the abbey destroyed. The rebuilding of the abbey was financed in part by King Robert the Bruce. On Bruce’s death, his heart was interred at Melrose (his body is buried at Dunfermline Abbey). The abbey was attacked many times over the years, and the remaining rose-stone architecture dates mainly from post 1385 re-construction. Nonetheless, Melrose is regarded as “one of the most magnificent examples of medieval church architecture anywhere in the British Isles”. Today you can see much of the beautifully ornate sculpture of the building, including the figures of angels, demons, hobgoblins and the famous bagpipe playing pig. 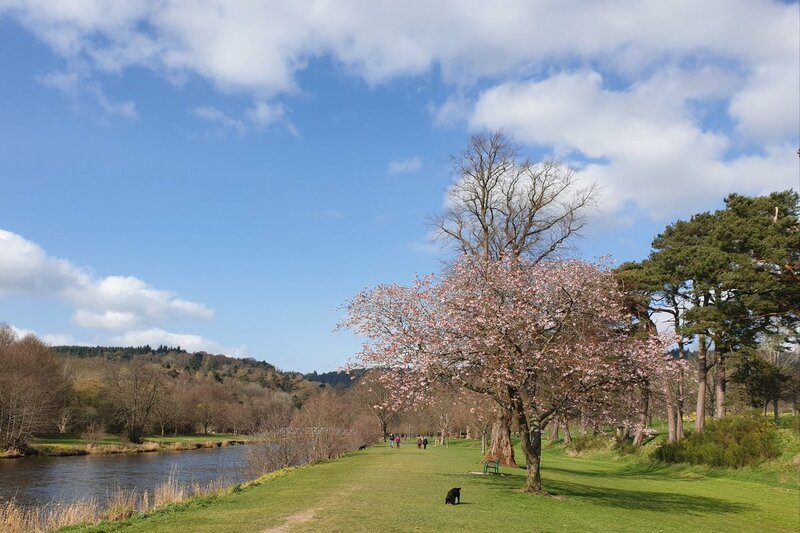 The abbey at Dryburgh, four miles to the south east of Melrose, is beautifully situated in peaceful parkland by the banks of the River Tweed. The abbey was founded in 1150, and the monks at Dryburgh belonged to the Premonstratensian Order (the White Canons). They lived a life of dedication to God ruled by austerity, abstinence and fasting. Like Melrose, Dryburgh was burned to the ground in 1322 by Edward II of England, and then again by Richard II in revenge for Scots raids on the north of England. However much of the abbey has survived, and the abbey church and cloister are substantially complete. Sir Walter Scott, the novelist, and Field Marshall Haig, the somewhat controversial figure who led British Army troops in WWI, are both buried in the north transept. Again founded by David I, an Augustinian order (the Black Canons) was established at Jeburgh in 1138. A prominent landmark in the town, the soaring Gothic architecture of the abbey dominates the town as you approach from the English border to this day. Its proximity to the border meant that Jedburgh frequently came under attack from English troops, and the town and the abbey itself were repeatedly attacked and/or occupied by the English throughout the 14th, 15th and 16th centuries. Remarkably, today the magnificent abbey church of St Mary the Virgin stands almost intact, along with a reinstated cloister garden. There is also a visitor centre which displays artefacts excavated from the abbey grounds including the “Jedburgh Comb” which is made of ivory and dates from around 1100. Belonging to the Tironensian Order, Kelso Abbey was founded by David I in 1128. At one time Kelso was the grandest of the abbeys, and extremely powerful, owning surrounding lands, schools, farms and churches. Like the other Border abbeys, Kelso suffered greatly during the Wars of Independence and was finally destroyed on the orders of the English King Henry VIII in the 1540s. Today unfortunately not much of the original building remains, but it is still an impressive reminder of what this building once must have been.